Despite launching the Thailand 4.0 initiative two years ago, Thailand is on track to lose as many as three million jobs over the next 20 years if it fails to adapt to new disruptive technologies, according to the Thailand Development Research Institute (TDRI). Thailand 4.0 is a new economic model launched by the Thai government which aims to transform the country into a high-income nation. To achieve this, the government there has identified areas that will propel its development agenda forward, with robotics and digital technologies among the new areas identified to lead the charge. However, Thailand 4.0 may not be comprehensive enough to achieve the ASEAN state’s development goals. At the TDRI annual conference earlier this year, its president Somkiat Tangkitvanich predicted that the country would see massive job losses without concrete plans in place to navigate the radical changes in technology that are currently ongoing. “Thailand lacks an AI strategy and that is a big concern,” he said. In addition to potential job losses, the government’s target of having the economy grow at an average of five percent every year would also be unfeasible, according to Somkiat. He projects that Thailand’s economy would only grow by 2.1 percent per annum moving forward if the level of technology expertise in the country remains unchanged. Experts are concerned that even if the Thailand 4.0 initiative is successful, its economic benefits would be rather limited. The Thai economy would only expand at 3.1 percent while millions of jobs could be lost. 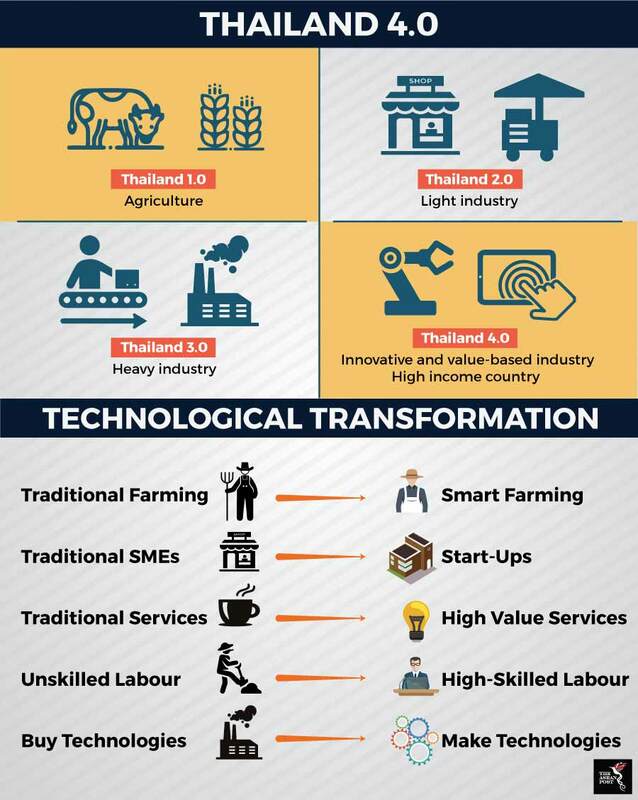 The Thailand 4.0 initiative indicates that the government is supportive of technology, particularly through its push to integrate new technologies into various sectors of the economy. Disruptive technologies such as automation and robotics are most likely the areas that will cause employment disruption. Thailand has a strong manufacturing and textile industry, both of which are prime targets for technologies such as automation and robotics. With such technologies promising greater production efficiency at lower costs, more and more firms are beginning to integrate them into their production lines. Vice President of the Thai Automation and Robotics Association (TARA), Narakorn Ratchapolsitte believes that industry automation is unavoidable for the country. “TARA's survey has shown that in the next one to three years, 50 percent of Thai industries will have more readiness to adopt automation systems. In the short term, large companies are ready to automate while smaller ones will need more than five years to do so. This means the trend for industrial robots and automated systems in Thailand is strong and well-established,” he explained. The biggest casualties as a result of the introduction of automation and robotics would be unskilled workers, as their jobs are frequently among the first to be automated. Data from the National Labour Development Advisory Council reveals that Thailand has 16.9 million unskilled workers, which account for 45 percent of the total workforce. Research from TDRI shows that there are 8.3 million Thais working in high-risk occupations – jobs where the estimated likelihood of them being replaced by AI is over 70 percent. Thailand does not seem to have a plan in place to tackle this issue. While plans for Thailand 4.0 show that it wants to transform unskilled labour to high-skilled labour, the government has yet to outline a clear policy to achieve this goal. To actually prepare for such disruptions, Thailand needs to introduce a framework which exploits the best of new technologies whilst keeping the interests of its citizens in mind, through initiatives such as retraining and reskilling programmes for workers. This way, if workers are retrenched due to technological disruptions, they can easily find employment in new industries. The government also has to prepare for the prospect of protecting the welfare of those who are made jobless due to technology. The TDRI has also proposed the development of a “3 C model” - craft economy, creative economy and care economy. These industries often rely on human capital instead of technologies, therefore if these industries were properly consolidated, there would be less worry about disruptive technologies taking over certain sectors as there are other industries to enter. If unskilled workers are left to fend for themselves without government support, there could be major consequences, such as the contraction of economic growth. An unproductive labour force that has no wages to contribute to economic activity would have a negative impact on the economy. Furthermore, a large unwaged population is a recipe for national unrest.